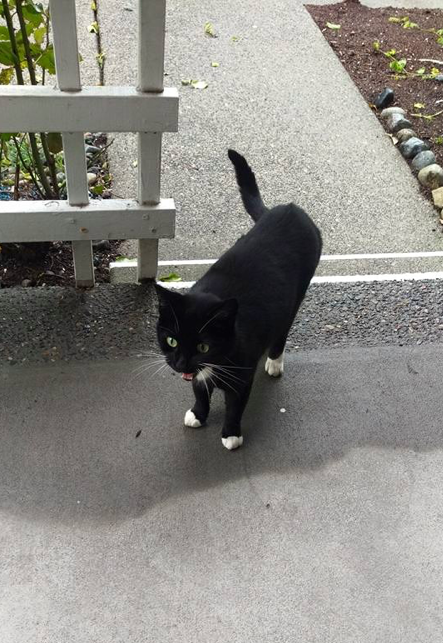 You are here: Home / Cat Rescue / What Do You Do When a Cat Shows Up On Your Doorstep? This is Tara. She was a scared stray cat who showed up on a doorstep looking for help. Last week, we wrote about what to do if your cat goes missing. 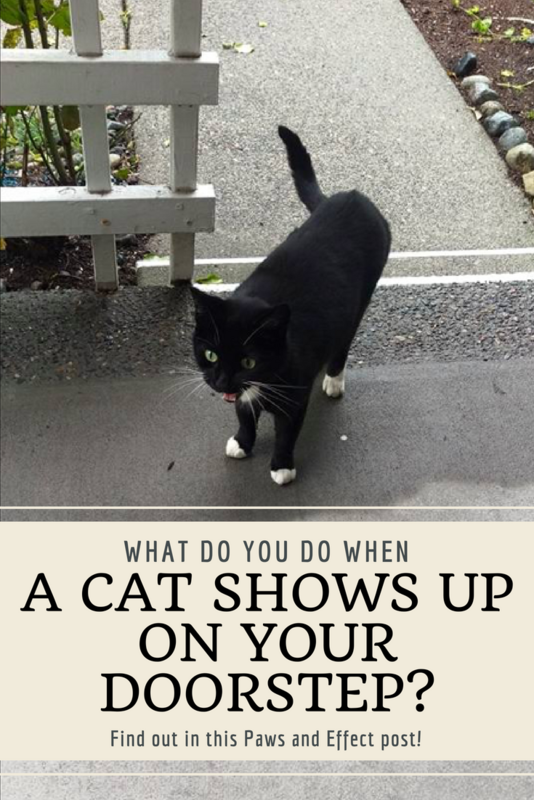 One of our email newsletter subscribers, Beverly, asked a very good question in response: What do you do if a stray cat shows up on your doorstep? Well, we’ve got some answers for that question, too. (Also, if you want to subscribe to our weekly newsletter, you can just enter your email address in the box to the right.) So let’s get started! Tara: You see, in November of 2015 (wow, I’ve been here at Paws and Effect HQ for almost three years now!) I was one of those wayward cats who found herself cold and wet and standing on a doorstep looking for love. This was the first time Mama had ever seen Tara. Tara: So, it’s a good thing that Auntie Hannah texted for advice, because that was the first time Mama got to see me. Also, it’s not all that often here in the city that a stray cat shows up on your doorstep, so it was kind of a big deal for Auntie Hannah and her friends. Thomas: So, what did Auntie Hannah and her friends do when Tara showed up at their place? She wasn’t wearing a collar or anything with a person’s phone number on it, so the first thing they did was to put notices on our local Craigslist and other online forums related to our neighborhood. Nobody responded to say they were missing a cute tuxedo kitty. Bella: Then they took Tara to the vet and had her scanned for a microchip. She didn’t have a microchip, either. At that point, Auntie Hannah and her friends had a choice to make: either they could take her directly to the shelter and surrender her, or they could get her a good vet exam and vaccinations. Tara: And because Auntie Adrianna was involved, Auntie Hannah and her friends got her thoroughly vetted and took her back to their place. Thomas: There was just one problem: Auntie Hannah’s friends already had a cat, and she was a very jealous kitty who wanted zero other cats in her space. Bella: To give you a little background about what was going on at Paws and Effect HQ at the time, it had been about six months since our beloved Siouxsie Mew had died, and we were all starting to get on with our lives–not that we would ever forget her, of course, but we were getting used to being a two-cat household. And Mama thought she’d never adopt another cat until one of us died, because it’s super-hard to get an apartment when you have three cats! Tara: But then Auntie Adrianna invited Mama to come over to visit Auntie Hannah and her friends–and me! I was a little suspicious at first, because Auntie Adrianna was carrying something that looked suspiciously like a kitty carrier. But she was also carrying food, and I was pretty hungry. Thomas: We had no idea all this was going on, of course, but we did suspect something was up. Tara: And then Auntie Hannah let me come inside with Mama and Auntie Adrianna (the jealous kitty was in the bedroom, and the door was closed). As you can see from this photo, it was love at first sight when I met Mama! Mama gave me a big hug, and I purred and kneaded the whole time I was in her arms. Thomas: Mama knew that Tara had been to the vet, that she’d gotten her shots, and that she’d been given a dose of Advantage because she had fleas. Tara: It wasn’t my fault I had fleas! The feral cat who snuggled me and kept me warm the first night I was on the streets gave them to me! Bella: It’s okay, Tara. We don’t hold it against you. Thomas and I didn’t like it when Mama gave us a dose of flea goop so we we wouldn’t get them, though! Post ads on Craigslist and other online forums for your area. 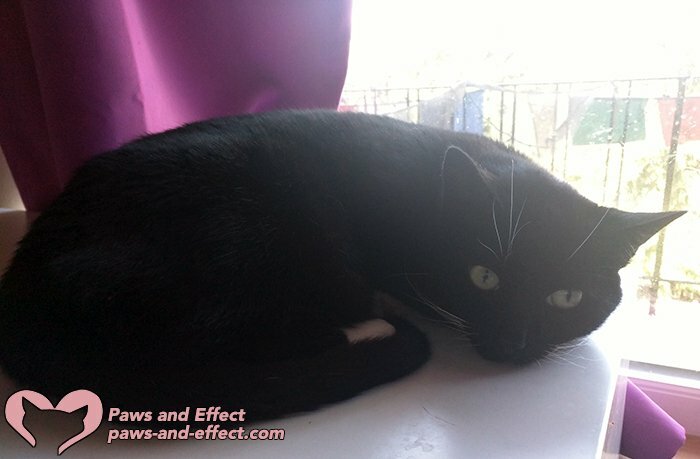 Describe the cat generally, post a photo if you like–but be sure there’s some identifying mark like a distinctive fur pattern (Tara has a little white lightning bolt on the under side of her chin, for example) that’s not visible on the photo. This will help you confirm that the cat really belongs to the person contacting you. Check “lost pet” sections on Craigslist and local online forums to see if there are any missing pets that match the description of the cat who showed up on your doorstep. Contact shelters in your area to see if they’ve received any calls or emails about a missing cat matching your foundling’s description. Make posters with a photo and your phone number, and hang them around your neighborhood. Do the same thing as above in terms of making sure there’s a distinctive identifying mark that’s not visible on the photo. Go to a veterinarian or shelter and have them scan the cat for a microchip. If there is one, try to contact the registered owner. If there isn’t one, you’ll need to choose your next step. You can either adopt her, help a friend to adopt her, or surrender her to a shelter. Tara: And guess what Mama decided to do. She decided to take me home! It took me the better part of a year to start really feeling like this is my forever home, but now I’m settled in and confident. Thomas: I’m so glad you’re here, Tara. You’re such a sweet girl! Bella: And I like having you here, too, Tara! Thanks for adopting Mama! Tara: What about you other readers? Have you had a stray cat show up on your doorstep? How did you deal with it? 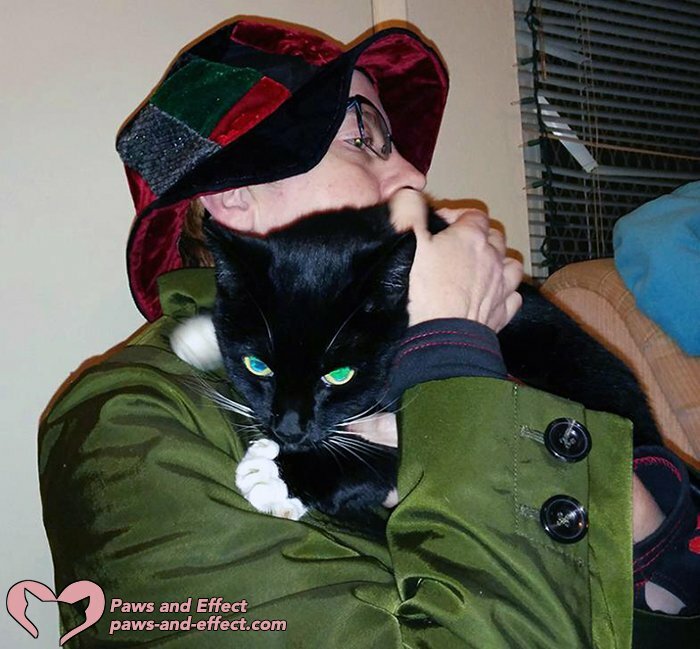 Were you able to reunite the cat and her person? If not, did you adopt them? If you didn’t adopt them, how did you make sure the cat would stay safe and healthy? Tell us all about it in the comments! Is Your Cat Fixed? You Could Win Cool Cat Stuff! Congratulations to Blind Cat Rescue & Sanctuary! Yes, I AM a Cat Parent!